Brickwalk is a systems integration firm specializing in business process management, including development of business requirements – an essential, yet complex, first step for process change. While IT executives say they understand the importance of business requirements, many do not properly manage all the many nuances on how requirements are developed and analyzed. This white paper, "Purpose. Process. 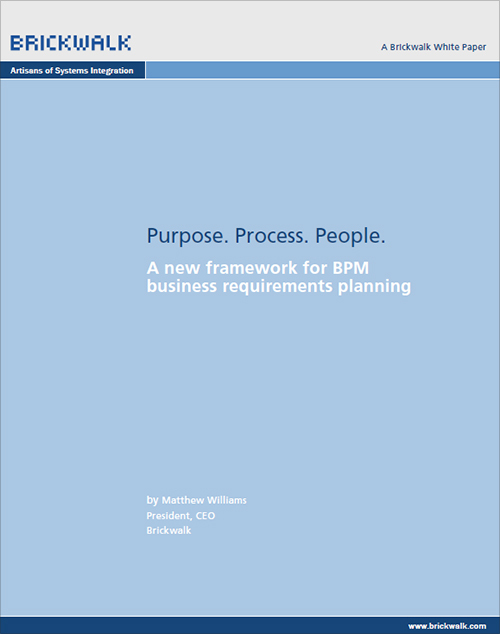 People" (PDF) presents Brickwalk's best practices. It illustrates an approach that balances a disciplined framework with change management processes to maintain flexibility during the complete project lifecycle.